In his conducting career Nader Abbassi benefits from his exceptionally wide professional experience as a singer, bassoonist and composer.In July 2011 Nader Abbassi was appointed Artistic and Musical Director of KATARA Culture Foundation, Doha - Qatar. From 2009 to 2011 he was the first Musical Director & Principal Conductor for the newly formed “Qatar Philharmonic Orchestra” (QPO), from 2002 until 2011 he was the Artistic Director and Principal Conductor of the Cairo Opera Orchestra. In 2002 Nader Abbassi made his acclaimed debut conducting "Aida" at the pyramids in Giza. Following this production he conducted many operas and ballets (including: Mozart, Rossini, Verdi, Puccini, Bizet, Tchaikovsky, Stravinsky, Mascagni, Leoncavallo, Bernstien, prokofiev). Under his direction the Cairo Opera Orchestra was invited to various festivals, opera productions and concerts (Greece, Mexico, Germany, China, Oman). Nader Abbassi is also the artistic director of the "Orchestre pour la Paix" in Paris. This orchestra was founded by the Argentinian pianist Miguel Estrella and unites young professional musicians from all over the world for the promotion of a peaceful dialogue between different cultures and religions. Nader is a permanent member of the Jury of the “International Stenhammar Singing Competition” at Norrköping. In 2006 Nader Abbassi conducted Menotti’s opera "Maria Golovine" in the presence of the composer at the Marseille Opera House. Since then he regularly returned to conduct concerts and operas: “Hamlet”, “Un Ballo in Maschera”, “La Belle Helene”, “Aida” and “Carmen”. Recent opera productions include “Dialogues des Carmelites” at Opéra de Bordeaux, and “Aida” at Glimmerglass Festival New York USA, "Camren and La Traviata with the North West Opera (Ireland). The compositions of Nader Abbassi are being performed by many orchestras. Among others, the Geneva Ballet Company, Geneva Chamber Orchestra, Swiss Romande Orchestra, Qatar Philharmonic Orchestra and the Swiss Clarinet Players commissioned him new works. Orchester des Richard Strauss Konservatoriums München (Germany), Orquesta Sinfonica de Guanajuato, Symphony Orchestra of the state of Mexico (Mexico), Norrkoping Philharmonic Orchestra (Sweden), Euro Orchestra da camera di Bari (Italy), Lisbon Philharmonic Orchestra (Portugal), Incheon Philharmonic Orchestra (Korea), Slovenian Philharmonic Orchestra (Slovenia). HEM Symphony Orchestra (Geneva). He gave his US debut with the Sacramento Philharmonic Orchestra in spring 2008.
double chorus, one from Southern Ireland and the second from Northern Ireland. Doreen Curran (Northern Ireland) Flora. "Maurice Ravel / Boléro 15, 16 and 17 February 2004 Cairo Opera House "
Nader Abbassi offered a superb demonstration of virtuosity conducting Bolero, leading the obsessive masterpiece to an exciting end, while inevitably bringing the house down." AL-AHRAMWEEKLY - AMALCHOUCRI CATTA - FEBRUARY26TH, 2004 Giacomo Puccini / Madama Butterfly 27 to 30 January 2004 Cairo Opera House "Audiences were happy to see Nader Abbassi conducting the Cairo Opera Orchestra -- he has been missed the past weeks while his orchestra was conducted by Nayer Nagui and Taha Nagui - when he appeared on opening night at the head of his instrumentalists. Abbassi gave the public brilliantly performed music, filled with passion and moments of moving melodies, such as Cio-Cio-San's aria Un Bel di Vedremo of the second act; there was joy and tenderness as she sang for Pinkerton's hoped-for return." AL-AHRAMWEEKLY - AMALCHOUCRI CATTA - FEBRUARY3RD, 2004"
Main Hall Cairo Opera House "Cairo Opera Orchestra, under Nader Abbassi, rose to the occasion, bringing the scene to an exalted climax as the curtains slowly fell on Scarpia kneeling before the church's holy fathers." AMALCHOUCRI CATTA - AL-AHRAMWEEKLY - APRIL7TH, 2004"
"Nader Abbassi's enchanting baton was in perfect harmony with the general mood on stage and in the overcrowded hall. The audience loved every minute of the fabulous show." AMALCHOUCRI CATTA - AL-AHRAMWEEKLY - SEPTEMBER30TH, 2004"
"When Carmina Burana and Bolero were featured at the Main Hall, last year for three nights (on 15, 16 and 18 February 2004), members of the corps de ballet were in better shape, with star-conductor Nader Abbassi at the head of orchestra." AMALCHOUCRI CATTA - AL-AHRAMWEEKLY - MARCH2ND, 2005"
Main Hall Cairo Opera House "Nader Abbassi succeeded in adding color to a rather colorless show. His orchestra was soaring on the loveliest of tunes, bringing warmth and beauty and lots of nostalgia into the somewhat macabre plot." AMALCHOUCRI CATTA - AL-AHRAMWEEKLY - JULY13TH, 2005"
Main Hall Cairo Opera House "Tchaikovsky Nutcracker has turned into a lasting success, with Nader Abbassi's vibrant baton conducting the orchestra while giving us sensitive pianissimi and triumphant fortissimi and leading us into a world of fabulous melodies. Here as elsewhere, the Nutcracker has become a real Christmas favorite." AMALCHOUCRI CATTA - AL-AHRAMWEEKLY - JANUARY17TH, 2007"
Cairo Opera House "The curtain falls on the mourning courtiers and friends while the audience cheers in the Main Hall. The orchestra had its brilliant moments under the impressive bâton of Maestro Nader Abbasi and the choir was excellent under the direction of Aldo Magnato. As for choreographer- director Erminia Kamel, she created some splendid dancing interludes. 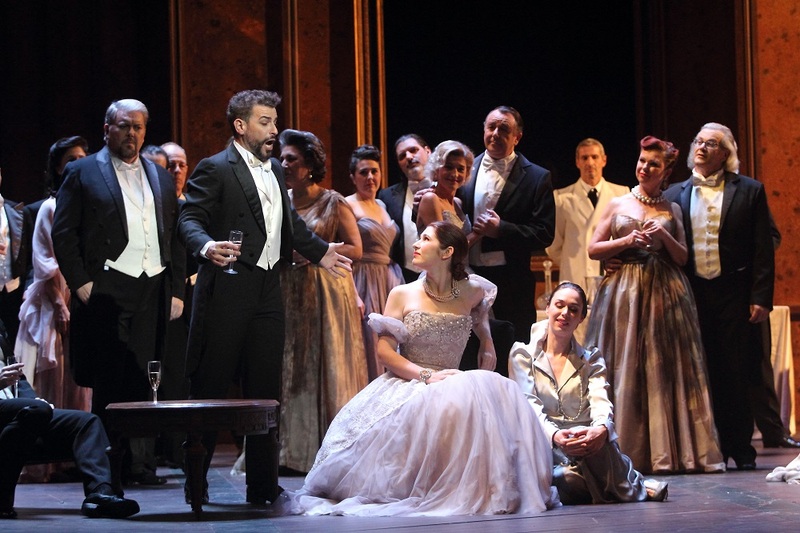 On the whole, Verdi's Un ballo in maschera enjoyed four successful performances. After an interval of four years, audiences were happy to applaud the impressive production of this remarkable work." AL-AHRAMWEEKLY- AMALCHOUCRI CATTA - JANUARY31ST, 2008"
Un grand bravo d’abord à Nader Abassi, qui obtient un presque sans faute de l’orchestre de l’Opéra. N’était la présence excessive des percussions dans la valse du troisième acte, qui tirent un peu trop la musique vers le caf’conc’, on ne peut que se réjouir de cette nouvelle collaboration entre la fosse et ce chef éclectique. Les préludes aux actes deux et trois sont de purs ravissements. La conduite du chef est d’une légèreté de touche qui rend justice à l’élégance de la musique d’Offenbach, et permet de comprendre et de ressentir l’admiration du compositeur pour les musiciens qu’il parodie. C’est vraiment du beau travail !" Enfin, pierre de touche, et pas des moindres, de cette réussite totale, la direction de Nader Abassi, qui ressuscite la partition de Thomas, en transcende chaque pupitre, faisant entendre des sonorités qu’on ne soupçonnait pas d’un compositeur si célèbre en son temps et aujourd’hui si méprisé. La partition est dense, parfaitement colorée, avec de très délicats interludes, un usage des cuivres très berliozien et des chœurs héroïques. Certes, Ambroise Thomas est un peu à la musique ce que Ingres est à la peinture"
Dans la fosse aussi, c’est un grand soir. Est-ce la présence des micros de France Musique ? Nader Abassi a obtenu de l’orchestre des finesses, une cohésion, un allant, une précision dans le dosage des effets, un contrôle des progressions sonores qui ont donné à cette exécution une qualité très particulière. On ne s’étonnera donc pas que le public ait longuement clamé son enthousiasme, apparemment partagé par des représentants du Ministère de la Culture. Faut-il voir dans cette présence l’amorce d’une évolution de l’Opéra de Marseille vers le statut d’Opéra National ?" "Un Hamlet de référence Nouvelle production d’Hamlet de Thomas mise en scène par Vincent Boussard, sous la direction de Nader Abbassi à l’Opéra de Marseille. Révélation absolue de la soirée, le chef Nader Abbassi, qui est depuis 2001 directeur artistique et chef principal de l’Opéra du Caire, galvanise son orchestre en défendant la partition avec un raffinement, une délicatesse et une conviction irrésistibles. Coproducteur de cet Hamlet, l’Opéra du Rhin le présentera fin 2011 avec Stéphane Degout dans le rôle-titre." à la tête de l’Orchestre de l’Opéra de Marseille au mieux, le chef égyptien Nader Abbassi, du début à la fin, de l’ouverture aux interludes si expressifs des actes, conduit sans faille cette riche partition dont il révèle, avec puissance et finesse, des trésors insoupçonnés, qu’on découvre ou redécouvre avec bonheur." "“Since I was a child..."
...Aida has been my favorite opera, and it was always my dream to conduct this piece,” Abbassi said. “I have had the honor to conduct Aida in more than six countries at important festivals – in Asia, Russia, China, Europe and in Africa by the pyramids where I belong. Now I feel the excitement and challenge of being an Egyptian conducting this great opera at Glimmerglass. I am thrilled, but overall I am proud.” The Egyptian Conductor who Conducted the Egyptian - Italian Opera (Aida) in France, Germany, China, Greece, Egypt, Russia we are Honored to have him Between us in Glimmerglass Festival NY." Conductor Nader Abbassi not only drew the best from the players, but also achieved a superb dynamic balance with the singers. Aida by Giuseppe Verdi, conducted by Nader Abbassi, directed by Francesca Zambello Glimmerglass Festival, Cooperstown, through Aug. 25 HTTP://METROLAND.NET/2012/07/11/A-TRUE-BLOCKBUSTER/"
Côté musique, la prestation de l’orchestre et des chœurs mérite toutes les louanges. Nader Abassi a dirigé souvent les musiciens avec d’excellents résultats. En cet après-midi la battue est nette, les indications inlassables, les mains expressives, la lecture d’une probité scrupuleuse, sans aucun effet trivial, et l’exécution irréprochable. Mais, est-ce la lenteur un rien traînante de certains tempi, pourquoi ce contrôle impeccable ne nous comble-t-il pas ?"